And now back to these wonderful gingerbread muffins. The deep color and robust flavor in this recipe comes from the dark blackstrap molasses. I love to use this sweetener whenever I can because of the extra nutritious kick that blackstrap molasses provides. I use it mainly on crepes, but during the Holiday season, I pack a few extra bottles in my pantry for my gingersnap cookies, gingerbread man cookies, Xmas granola (cranberry, pistachio, goji & gingerbread spices granola) or muffins. Be sure to buy the blackstrap molasses since it's high in vitamin B and essential minerals (iron, calcium, magnesium, potassium and manganese). Blackstrap molasses is significantly more bitter than "regular" molasses. For that reason, I also use pure maple syrup in this recipe to balance the taste so the end result is pleasant enough. See that gold sparkling muffin top ? I sprinkled organic turbinado sugar on top of the muffins. This sugar is a golden-colored raw cane sugar with large sparkling crystals that gives a nice crunchiness to cake, cookies or muffins. Turbinado sugar is made by crushing the freshly squeezed sugar cane juice, rich in vitamins and minerals. The cane juice is then evaporated and transformed in large crystals. Another interesting thing to know is that no chemicals, bone char, or animal by-products are used to make this sugar. In this recipe, I find that it really adds a special crunchy touch to these puffy muffins tops! You can sprinkle coconut sugar or organic can sugar instead. If I have candied ginger on hand I often add a few pieces on top of each muffin. 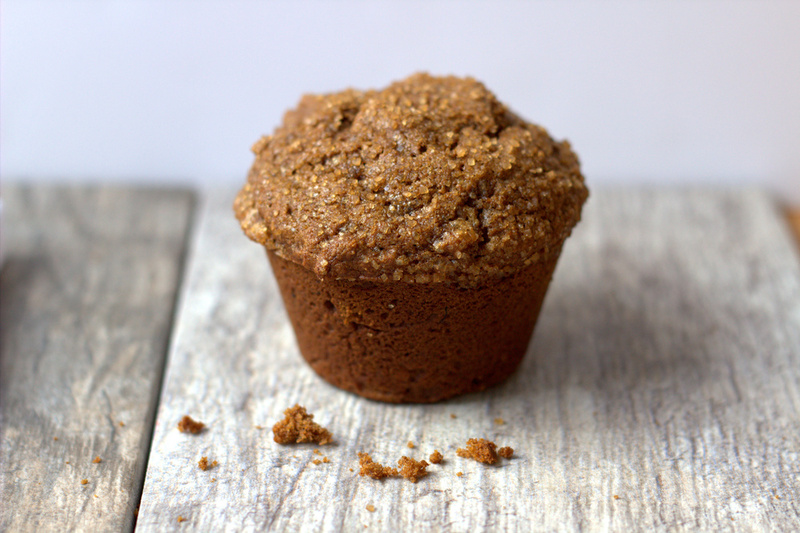 These vegan muffins are perfect for breakfast of snack time (they share the top spot with my banana and chocolat muffins on Noah's favorite muffin list! Nothing less!). But they also make a great holiday treat and would look superb on your Holiday brunch table! Pre-heat oven at 375°F. Grease your muffin pan or place paper baking cup in each muffin cup. In a medium bowl, mix together the flour, baking soda, ginger, salt, nutmeg and cinnamon. Set aside. In large bowl, beat (by hand or with a hand mixer) the coconut oil, blackstrap molasses, mashed banana, maple syrup, almond milk, apple cider vinegar spoon and ground flax seeds. Divide batter evenly among muffin cups. Sprinkle about 1 teaspoon of turbinado sugar on top of each muffin. Bake 18 to 20 minutes or until a toothpick comes out clean. Immediately remove from pan to cooling rack. Cool completely, about 30 minutes.